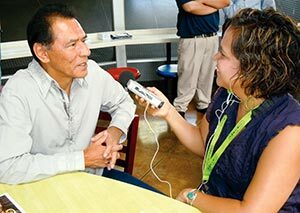 BOTTOM: National Native News anchor Antonia Gonzales interviews actor Wes Studi at the 2010 Roswell UFO Festival in Roswell, N.M. Studi was the Grand Martian. National Native News, hosted by Antonia Gonzales, Diné, is one of Koahnic Broadcast Corporation's four nationally syndicated radio programs and it provides public radio listeners with a regular, timely and balanced source of news about Native issues. The program covers the social, economic and cultural issues that affect many communities, and attempts to help radio listeners understand the interconnectedness between Native people and their non-Native neighbors. Fittingly, Gonzales is immensely interested in such issues. She encourages youth and Natives to pursue a career in broadcast journalism. Gonzales produces the daily, five-minute program, gathering and writing news and using news stringers across the nation and world. National Native News is distributed by Native Voice One and is produced in Albuquerque. The program is linked to the Public Radio Satellite System at 1 p.m. (ET). Gonzales was born on the White Mountain Apache Reservation of Arizona. "That happened because it was the nearest Indian Health Service hospital," she said. She was actually from and lived in Lakeside, Ariz. When she was 10 years old her family moved to Gallup. In high school she played trumpet for the Gallup High Bengals band. She was not into journalism at the time. Then she applied for scholarships and was accepted into the University of New Mexico. "But I didn't know what I wanted to do, so I started taking communication classes," she said. "I liked talking to people and hearing their stories." Gonzales interned for three Albuquerque television stations, channels 4, 7 and 13. At channel 4 she met one of her main mentors in Conroy Chino, Acoma. "He was an investigative reporter so he really helped show me the TV way," she said. He also introduced her to the Native American Journalists Association, for which she is currently finishing up her last term as board member. "I didn't know about NAJA when I was in college until I was a senior," she said, "but I credit NAJA for getting me a career in broadcasting. "After a weeklong student project, where professional Native journalists worked with us hands on, by the end of the camp I had tapes, which helped me get my first job in Carlsbad," she said. The small Carlsbad TV station was, according to Gonzales, "The best experience I ever had. I was a one-woman band reporter. I had to find my own stories, shoot stories, conduct interviews, write scripts and send them to the producer." On the other hand, she was apart from her husband of only a year. "It was hard," she says. "I was away from my family, but in the end, being a one-woman reporter was invaluable and I wouldn't trade it for the world." 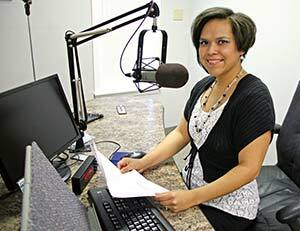 Gonzales is still a one-woman reporter of sorts as she produces and anchors National Native News. But she still felt she needed a change. "I was driving back and forth every weekend from Carlsbad to Albuquerque for the job, which I did for a year," she said. "I felt though my marriage was more important. Also, I missed my biggest fan - my mom." She moved to Albuquerque and had her first child. Then she took a year off. Soon, she had the opportunity to work at Native America Calling as a part-time associate producer. Next, Gonzales was backing up the anchor of National Native News and then started filing stories. Eventually she moved into the anchor position. "A lot of racism was involved, so I was programmed to think Indian was a dirty word," she said. "I do not think that today. Our mission at National Native News is to get Native voices to the world and to bring an indigenous perspective through all of our stories." National Native News is a stringer-based program, acquiring news from 50 journalists across the country. "There are people who unbelievably do not even know Native people are still alive today," remarked Gonzales. "So National Native News gets our issues out there and lets people know what's going on in Indian country." According to Nola Daves Moses, national station and audience relations representative for Native Voice One, "National Native News is broadcast on 277 radio stations across the U.S. and Canada, and online across the world. Less than 40 of the stations are tribal and the rest are public." "We are all connected with our issues in a way," Gonzales said. "We can identify with each other. Aboriginals and Natives from across the world say they need economic development, and some fear the destruction of their lands." Recently in Canada, First Nations women lost their Indian status if they married a non-First Nations man, so the government is amending it to get the status back to the women. In Australia the Aborigines do not have federal recognition status. "They are still fighting with land rights," Gonzales said. "They do not have the relationship with their government that we do. We have sovereign Indian nations here, but in Australia the Aborigines have no such status." In 2010 Gonzales received a phone call from an Australian listener of National Native News who invited her to come to World Press Freedom Day in Brisbane. At the event she and other journalists discussed the indigenous press. "I was the only American Indian," says Gonzales. "The goal was to achieve accurate reporting for indigenous people of Australia and elsewhere. There have been recent instances in Australian news where they still use N-word to describe the Aborigines." Gonzales is now affiliated with Indigenous Voice, which is a project run by the University of Queensland School of Journalism and Communication to develop cross-cultural awareness. Some students in the project have already produced news that has been aired on National Native News. "I encourage students into broadcasting and journalism as a whole because the number of minority journalists is decreasing," Gonzales said. "If a Navajo student wants to be journalist, I say do it, because we need to be the people who tell our stories. It is really important and it is a lot of fun."